FireFlex™ panels and hanging baffles are uniquely suited for environments where temperatures are high, sparks or other hot materials may fly, large numbers of people congregate, or high technology is used. It withstands constant temperatures up to 320°F, as well as meeting all Class 1 regulations for flame spread, smoke density, and fuel contribution. FireFlex™ materials are constructed of lightweight, porous acoustic melamine. The material's internal structure is a spacious cellular complex of slim, flexible webs. These elastic filaments are fiber-free and completely open-celled. When overhead sound control with Class 1 material is needed, FireFlex™ hanging baffles meet the requirements. 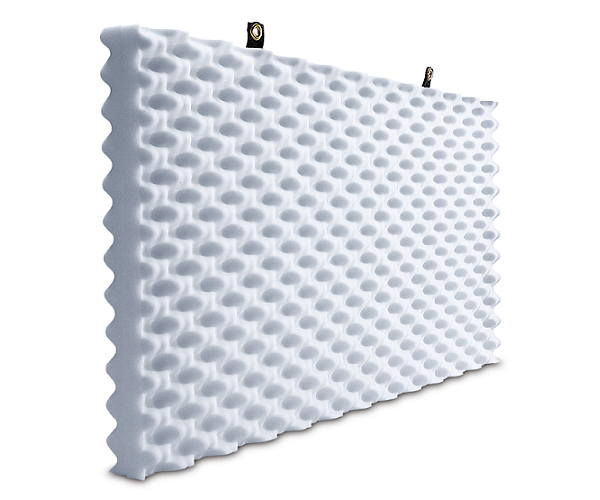 Each hanging baffle consists of two back-to-back 24" x 48" FireFlex™ contour wedge sheets. Baffles are 3" thick and are shipped assembled and ready to hang. 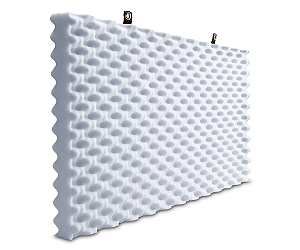 Hanging baffles are ideal for manufacturing areas and other high noise interior environments. -Materials are also sold per piece. Please request a quotation for your specific requirements. Minimums may apply.